In April 2012, we spent 22 days in Italy, France and the Netherlands. One of the toughest things to budget for was the average amount of spending money we’ll need per day. Bookings flights, hotels and car rentals before-hand meant that these costs were already accounted for. We also managed to book a great number of attractions online. What we were left with, are general day-to-day, cost of living expenses. We are currently in the preparation phase for our next trip, and it seems that we’re again down to the cost of living expenses. This time we are however armed with the knowledge learned from our previous trip, and I would like to share some of it here. As a traveler, I know how hard it is to find accurate information on this. When we arrived in Italy last year, our biggest shocks were how much things cost when converted to South African Rand. We quickly learned that this is the wrong way to approach purchases. Instead we took the spending money we had, and worked out a daily allowance for the duration of our trip. To check ourserlves, we took notes of every single item we bought each day, and made sure that the average spend throughout our trip did not exceed the initial daily budget we had set. Here is a short breakdown of what our average daily costs were, with a brief description of typical items bought. I’ve broken these down into two sections: costs with and without a rental car. The cost for the rental car is not included here, but associated costs like tolls, petrol and parking have been factored in. In total, our average came to €74.83 per day for two people. A summary of our expenses in Italy, France and the Netherlands in April 2012. Click the image for a bigger version. Water taxis in Venice, souvenirs, groceries (bread, cheese, salami or other cold meats, fresh fruit and veggies, pasta, canned goods, butter and other spreads, yoghurt and breakfast cereals, some beer and/or wine, snacks like chips and cookies), entrance to museums and basilicas, Pompeii entrance fee and maps for Pompeii and Assisi, guided tour of the Vatican with audio-guides, bus and metro guidebooks in Rome, five-day metro passes in Rome, eating out for dinner at reasonably priced restaurants, coffee at cafés. Metro passes for Paris and Amsterdam, groceries (bread, cheese, salami or other cold meats, fresh fruit and veggies, some beer and/or wine, snacks like chips and cookies), artwork and souvenirs, entrance to museums and the Eiffel tower, dinner out in Paris, coffee at cafés. Single use bus tickets, groceries (bread, cheese, salami or other cold meats, fresh fruit and veggies, some beer and/or wine, snacks like chips and cookies), toll for use of all highways, diesel to refuel the rental before returning it, guidebook to the Ufizzi gallery, entrance to Medici chapel, cold & flu medicine, lunch and occasional coffee at cafés. Note: These costs also include a dinner out for my birthday, as well as two birthday presents for me: a leather jacket and a pair of leather gloves. Reliving our trip in April digitally over the last few months has been amazing. Sometimes I wish I’d taken more photos and other times I wish I had spent less time behind my camera. Either way, I have loved capturing the trip here. 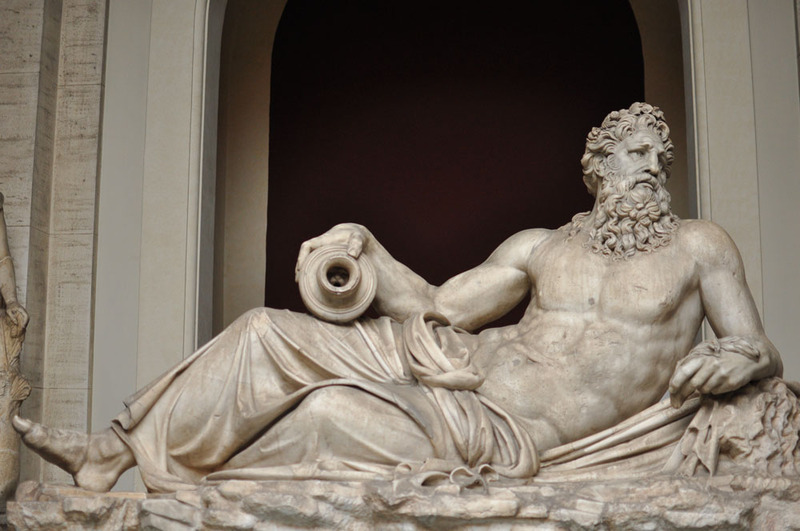 Continued from part 3.1: Rome (Pompeii & Vatican City). 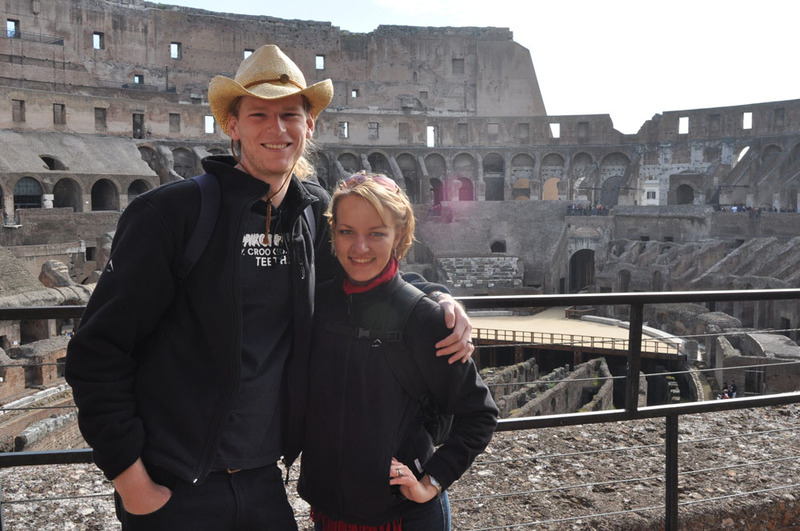 We are up early and after a hearty breakfast, we set out in an attempt to miss the crowds at the Colosseo and surrounding historical sites. The metro lines are packed with people on their way to work and we are shoved into an already overfull cart, bulldozing the people in front of us deeper into the mix as the press of bodies from behind intensifies. We arrive well ahead of the tourist crowds, and are rewarded with almost an hour of tranquillity in the stunning ruins of the Colosseum. The sheer size of what remains today is simply magnificent and we walk through the two upper levels of the old building constantly amazed at what Rome built in its hey-day. 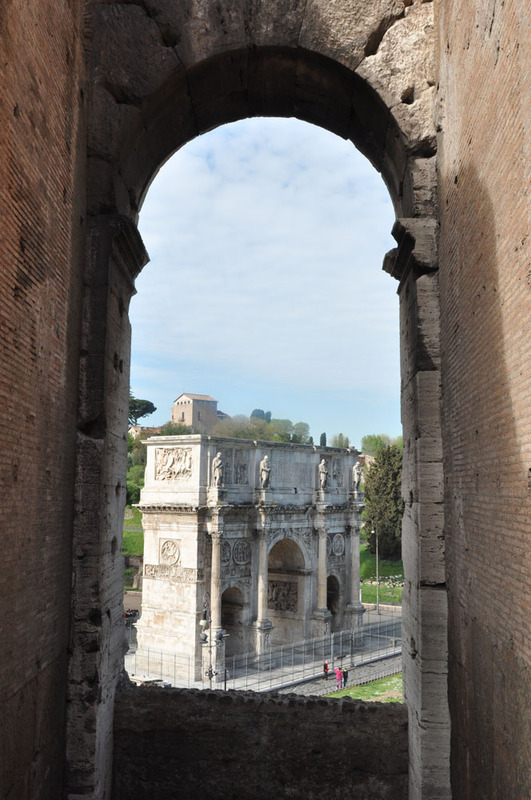 From the Colosseum we walk past the Arch of Constantine towards the Roman Forum, where we whiz past the lines of people waiting outside (as we’ve bought tickets that allow access to most of Rome’s historical sites). 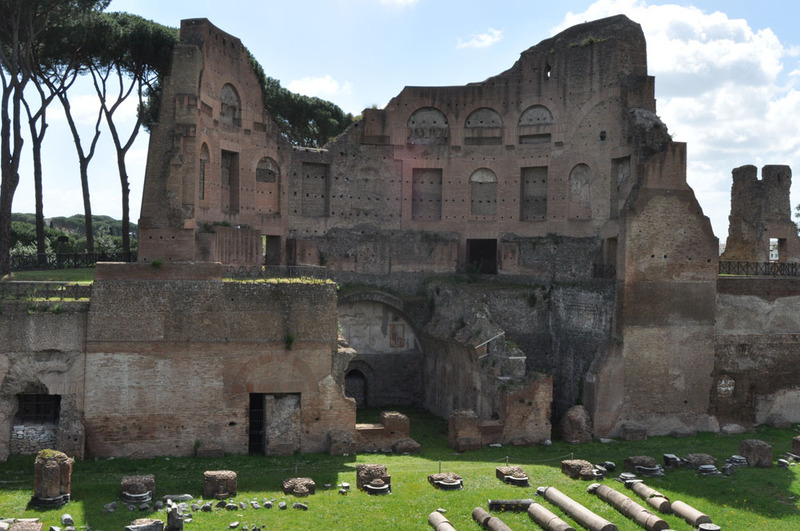 Though impressive, the ruins of Rome eventually all start to look very similar and, after having lunch in the shade of a few trees, we decide to go in search of something a little more modern. As we stroll through the streets of Rome on our way to the Imperial Forum, we happen to pass by the Vittoriano Complex, where there is a Salvador Dali exhibition on show. Dali is one of my all-time favourite artists, and after seeing two of his works in Venice, I insist on returning to the exhibition before we depart the city. We then continue on our original quest. The Imperial Forum is an amazing and imposing building, with many statues and a lot of small details. It seems that once could stand and stare at it for ever and a day, and still find something new in the façade. After feeling a little indecisive as to where to head next, we sit down under some great trees in front of the Piazza Venezia and watch a street artist using cardboard strips, rumpled up newspaper and spray-paint create a beautiful image of the Colosseum at twilight. Finally we settle on a (rather boring) plan. Our three friends will return to the flat for some much-needed rest, while Francois and I make our way to Termini station. The Cash Passport onto which we have loaded all our foreign currency has been giving us some problems, and we’re hoping to find a ForEx branch that can help. We arrive at the station and approach a foreign exchange desk and explain our problem. The gentleman explains that he can’t help us with the Cash Passport, but that we should be able to withdraw money from the account through their service. Hope flickers brightly, but the transaction is denied and we’re left wanting. He suggests we visit a bank branch, and in broken English and with a few gestures we head in the general direction we think he was pointing at. No one in the branch understands a word of English, but to their credit they do figure out that we would like to withdraw some money and point us (very helpfully) in the direction of their ATM. As we already know that the card doesn’t work at ATM’s, we head straight out and I’m sure we leave them quite perplexed. In a desperate attempt we decide to bite the bullet and to make an international call using a pay-phone and my credit card, in the hopes that we will be able to contact the help desk. We seem to be too blonde to figure out how to manage this though, and after smsing our families in South Africa it dawns on Francois that, if we can find an internet cafe, he should be able to reset his pin from his online profile. We stumble into an internet cafe not a block from Termini station and within a few minutes, Francois says that he thinks the problem should be solved. We head to the nearest ATM and stand in front of it with trepidation. We are down to our last 10 Euros, with more than three weeks left in Europe, and the money in my account has all been earmarked for accommodation and car rental payments. He completes the transaction, and the sweet, sweet sound of an ATM counting out cash rings in our ears. I have never been as happy in my life as at that moment! We sms the three stay-at-home-stooges to meet up with us at Termini station, from where we set out to the Spanish steps. The steps were never high on my “things to see in Rome” list, and true to my expectations they are overcrowded and overall a little disappointing. The view from the hill behind the steps is, however, amazing. We head into the Villa Borghese gardens and thoroughly envy the people zooming around on their Segways. Day seven of walking almost everywhere is finally taking its toll on our feet and bodies and, though we wish otherwise, we are spent and absolutely tired. 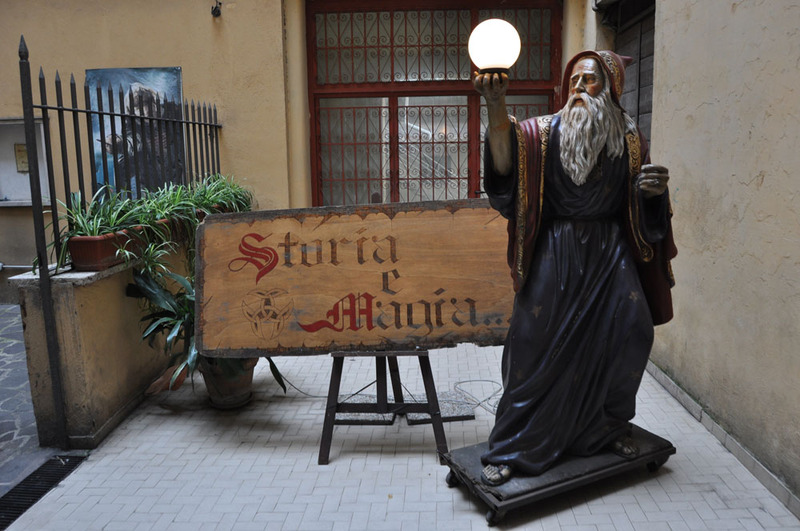 As we head back to our ‘home’, we stop in the neighborhood close to the Vatican to visit the market we saw on our first day here, as well as going into the Storia & Magia shop. It’s an amazing fantasy shop with exquisite jewelery and is absolutely every geek’s fantasy come true. They stock everything from Lord of the Rings, Star Wars and Harry Potter to Firefly and then some paraphernalia. I decide there and then that I will definitely have to visit Rome again, even if it is just to return to this shop! I buy a gorgeous silver dragon ring and grin like a little four year old all the way back home, where we spend another evening of storytelling, great food and (surprisingly) good wine. 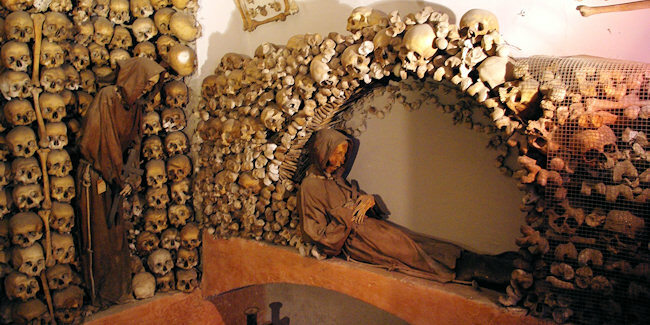 I have a somewhat unusual fascination with the macabre, and the Capuchin Crypts fell right into this category. This was very high on my must-see list for Rome, so after having breakfast and finally finishing with all the washing, we set out to find the crypts. Please skip the photos below if this does not sound like your cup of tea. The woman who welcomes us is witty and handles the funny characters who enter the crypts in such a deft way. I fall in love with her at once, and more than once we struggle to contain our mirth as she tries to make it clear to some other groups of tourists that no photos are allowed. 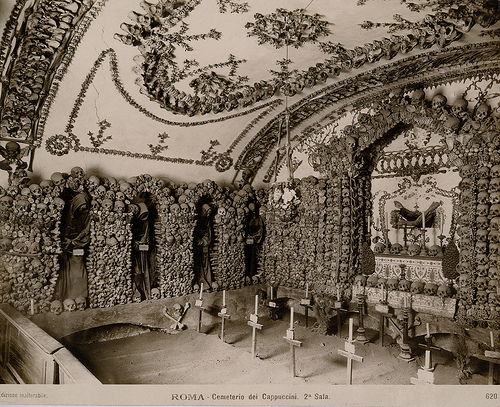 The crypts are eerily small and intimate, with low-hanging ceiling ornamentations and intricate designs all made from various parts of the human skeleton. It’s the creepiest, most wonderful experience! 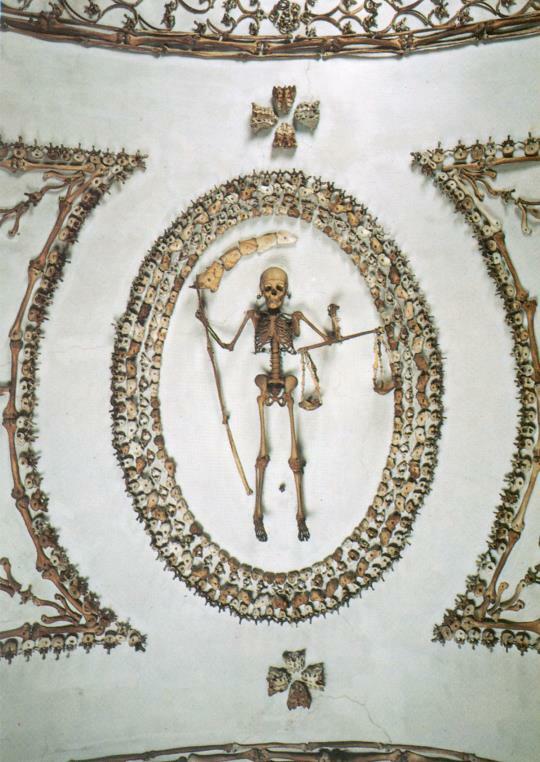 The forms of the ornamentations and wall decorations are exquisite and, for as long as you forget that they are skeletal parts, it’s really astonishing. The realisation does however soon settle in that you are looking at human remains and, try as one might, it sets my scalp a-prickle and a shiver down my back. We leave the crypts behind and head deeper into Rome on our way to the Trevi Fountain. 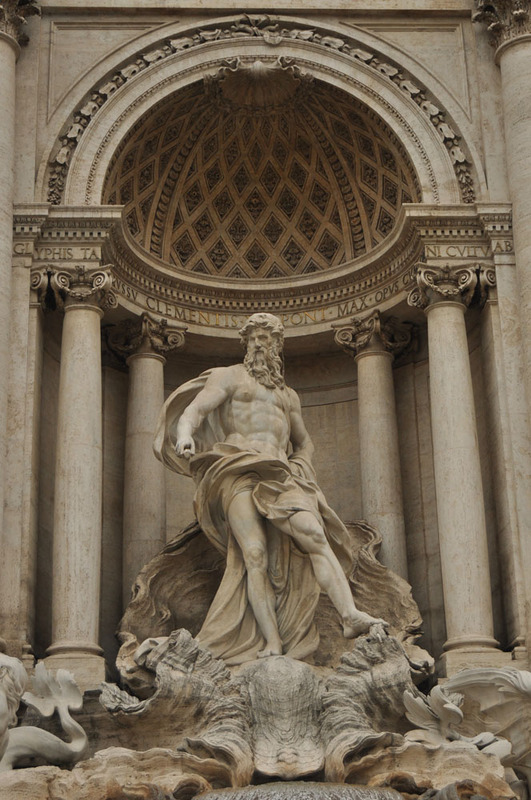 It’s another cold and rainy day in Rome, but despite that the fountain is packed with tourists snapping away and enjoying the view of the magnificent statues. We get a few scoops of gelato from a nearby shop, and sit on the steps directly in front of the fountain enjoying our sweet treats like children. From the fountain we head to the Pantheon, stopping over at the Church of St. Ignatius on the way. The pantheon is a super structure and again it’s incredible to think on how old these buildings actually are. Once inside, a lot of natural light is allowed to enter through a massive hole at the top of the dome, and the rain gently drifts down to the marble floor below (which is slanted slightly down and to the side to allow the water to drain). The art and historical significance entombed in this building is amazing! After revelling in the weird and wonderful all morning, three of us decide to submerge ourselves in Dali’s surrealism whilst the remaining two head home to catch up on some sleep. The exhibition encompasses a range of different mediums, including a video installation and lavish costumes that Dali had designed for him and his wife for the Venice carnival. Also showing is a digitally remastered and rendered animated short film that he worked on for Walt Disney. I lose myself in the paintings and magnificence of his works and I have no idea how long we spend there. When we do finally leave, we head back into the cold rain that seems to insist on staying. We go home and have dinner together, making plans for the evening. The day we checked into the flat, the owner showed us the areas that have a reputation for their night-life, and we decide to take the weather on and spend an evening in Campo de’ Fiori. We take the last metro train to the stop at the Colosseum and walk to the square, which is filled with bars and students. Finally we find a spot with reasonably priced beer and a table open inside, and we settle in. Our pitcher of beer soon runs out, and the next round is a pitcher of a very strong cocktail. Luckily there are five of us, but as we head home later that night (in the rain) we sing Afrikaans folk songs all the way to the night bus’s stop at the Colosseum. What a great evening! Tomorrow we collect a rental car from Termini station and head out to Florence. Continues in part 4 with our trip through the Tuscan countryside towards Florence, Italy. You can find more of our photos from Rome here. Header photo by Deon Joubert. All other images by the author: © catterflyworx 2012. Continued from part 2: Assisi. I am breaking our time in Rome into two posts. 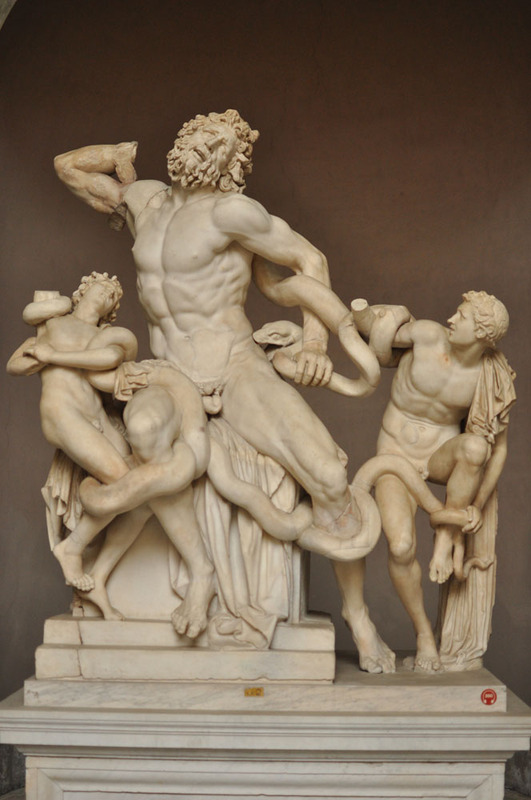 This first post will focus on our trips to Pompeii and the Vatican, while the second will be about the rest of our time in the city. From a small train station in Foligno, we spend one and a half hours standing on the train all the way to Termini station in Rome. It is incredibly busy and a little overwhelming. This is our first encounter with any metro system, and we are a little lost as to which metro passes will offer the best value. My engineer husband insists on first working out how many trip on average we are most likely to make in a day (factoring in all the obvious ones), adding a few incidentals, and then comparing that with the cost of a five day pass for the trains and buses. We find a news stand and buy our passes, and head down into the depths of Rome’s metro lines. We are staying in a Bed & Breakfast within easy walking distance of the Vatican our first two evenings. We find our lodging without too much difficulty, and again realize that we will have to look for a local grocer that’s still open in order to restock our supplies for lunch and dinner. After walking around the Castel Sant’Angelo and discovering a little market as it is closing for the evening, we give in to our tired feet and aching bodies, and set off in search of a restaurant rather than a grocer. We have some delicious pizza and lasagna and head home. We have an early start in the morning with a day-trip to Pompeii. Up early (bright eyed and bushy tailed, more bushy tailed for some), we join our tour group for the two hour bus drive to Pompeii. We stop along the way at an Auto Grill next to the highway, and are super surprised to see that they sell everything from kids’ toys to wine and groceries. We arrive in Pompeii and realize that we’re starving, so after getting our entrance tickets, we find a little shop just outside the ruins and have some delicious sandwiches packed with cold meats, lettuce, tomato and mozzarella. We buy a guidebook with map before heading in, and finally we are trundling along the ancient roads of Pompeii. 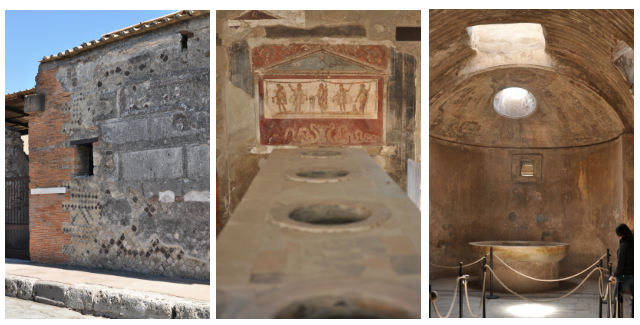 As with most cities you visit as a tourist, we realize the whole of Pompeii will be too big to see in one day, so we set about prioritizing what we want to see and devise a route that will encompass all of these. Halfway through said route, upon rounding a bend expecting to find the Lupanar and instead finding the stadium, we realize we are hopelessly lost. The closed-off roads for excavations and “renovations” have clearly played havoc with our sense of direction, and I feel a little happy that I was not the one in control of the map. We walk down the cool, pine-lined road and I know that the smell of cold air and pine cones is one I will forever associate with Italy. We spend a little time taking a break on the grass and collecting our strength, before moving along to the Gladiatorial training arena and amphitheater. Francois loves this part of the ruins, as he has been watching a lot of series like Rome and Spartacus. Finally we find the brothel, and quietly snigger at the age restriction signs outside the door. The artwork inside is amazingly well-preserved, as so many other frescoes and mosaics throughout the city. To me, this is the most fascinating part of the whole experience – how exquisitely rich the colours are in these works that have been through so much and dating from so long ago. We return to Rome along with what seems like the rest of Italy, as it is the end of the Easter weekend. We arrive back in Rome with barely enough time to catch the last metro train to our B&B, and set off in search for a spot to have dinner at. It is a cold, rainy, miserable day. We get out of bed late and lazily have breakfast, before checking out of our B&B and heading to Termini Station, where we’ve arranged to meet three of our friends. We are spending the next three nights together in Rome, sharing an amazing apartment on Piazza Bologna. We store our luggage on Termini and they rush off to join their tour of the Vatican ahead of us. Francois and I have more time before our tour starts, so we get a panini for lunch and wait around in the rain before we can get in. 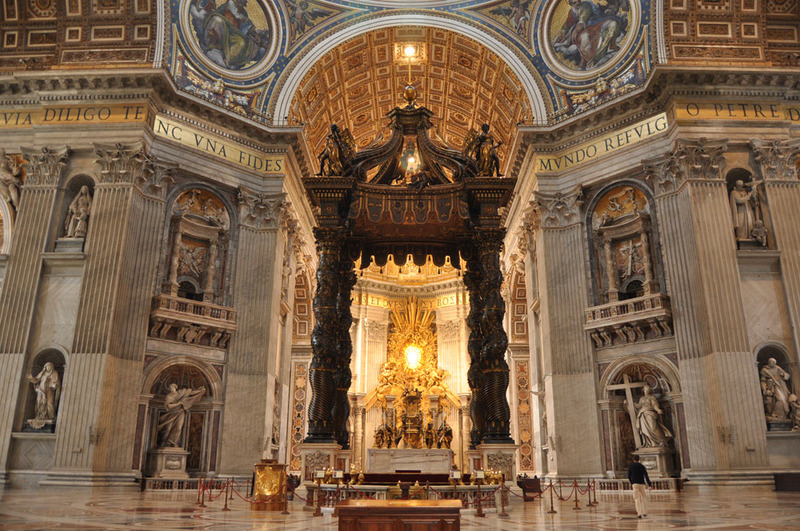 We’ve booked our tickets to the Vatican online and luckily that means we get to skip the insanely long queues and walk right in. We receive earpieces and our guide meets us in the foyer. While we’re waiting for the rest of the group, I buy a postcard to send to my mom from the Vatican City. We start with a virtual tour of the Sistine Chapel, as the tour guides aren’t allowed to accompany the groups inside and talking is firmly shushed by the Vatican guards. She explains in intricate detail the significance of the Last Judgement, leading us through it’s creation, alterations and historical controversies. 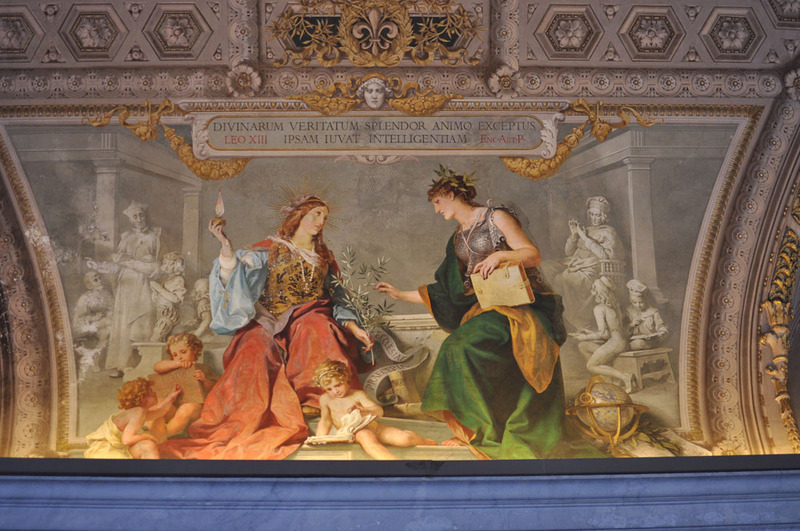 She then moves onto the amazing panels on the ceiling, constantly reminding us that Michelangelo was not a painter, but a sculptor. Every part of my being is tingling with anticipation… ever since the first time I saw pictures of the Sistine Chapel, I dreamt about seeing it. I am dumb-struck with the mere thought of the amount of amazing artworks we are about to see and it feels like an eternity before we finally start moving towards the museum. 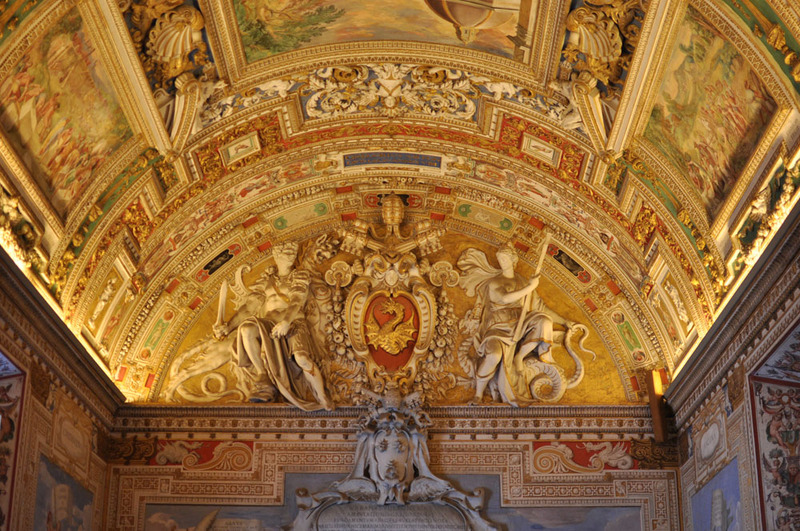 We are guided through a plethora of sculptures, paintings, frescoes, tapestries, relics, urns, tombs, mosaics and more. I revel in the experience. It’s inspiring. It’s jaw-dropping. It’s intimidating. It’s amazing! It’s… an overload on the system. There are absolutely no words that could ever describe this feeling! The Raphael rooms are overpowering in their vibrancy and richness. From the Raphael rooms, our guide bids us farewell and we are directed to the entrance into the Sistine Chapel. The walk to the door through which millions enter the chapel seems to take forever, but we finally arrive amidst a throng of people all craning their necks to see over one another, gawking at the Last Judgement while others stare straight up at the incredible ceiling. A few guards are assigned to keep the crowd quiet and to remind the visitors that no photos are allowed. Both directives are blatantly ignored, and it’s not the first time on our trip that I am disgusted with the gross disregard that people have with regards to requests not to take photographs. It’s a common occurrence to see people snapping away in ancient basilicas, with and without flash (though the former irks me to a level I can’t explain. I will get into this subject on a later stage). Finally we decide to leave the Sistine Chapel behind and we fall into the next line snaking its way to the entrance of St. Peter’s Basilica. The immensity of these churches, the lavish finishing, their age – it all seems too much to take in. I had some expectation before heading in, but nothing prepares one for the sheer overwhelming riches and imposing size of the collections of art and architecture. I’m also relieved to see that Francois is enjoying this, as I feared that the art historian in me might take over the trip and (eventually) bore him to death. After a day of sensory overload and historical splendour, we check into our flat on the ninth floor on Piazza Bologna and enjoy a great family-style dinner of pasta and wine with friends, recounting the time we’ve spent apart. Oh, and doing washing (so domesticated!). Continues in part 3.2 with our visit to the rest of the city of Rome, Italy shortly. 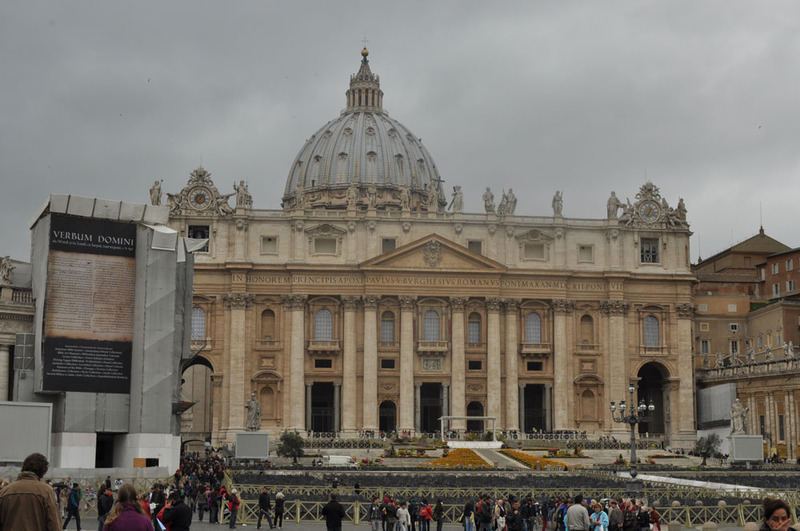 You can find more of our photos of the Vatican and from Rome here.